Today is Dia de los Santos (All Saints' Day), a holiday in Peru along with tomorrow's Dia de los Difuntos (All Souls' Day). For many of Lima's 9 million residents, it's time to prepare offerings of food, usually with little bread renditions of people and animals, to be placed on top of graves of departed family members. I'm in Lima on a layover before flying back to New York late tonight. Earlier this morning, I was still in Puno taking a colectivo (shared van ride) for the 45-minute ride to the airport in Juliaca. It was much cheaper taking the colectivo than a regular taxi although I was worried my duffel bag hauled on top of the van would fall-off. My Lan Peru flight from Juliaca arrived thankfully in Lima on time. Lima was swathed in fog as we landed in Peru's capital city. At the airport, I deposited my duffel bag at the Left Luggage counter since my New York-bound flight doesn't leave until 11 p.m. Jorge Chavez airport, like most airports I've been to, are swarmed with pesky touts and drivers. My way of avoiding them if there's no one meeting me is just to go outside the Departure Area where some sanity and calm exists. Like everywhere else in Peru, election campaigning is very evident as I took a taxi to Lima's Plaza de Armas. There were banners all around city streets announcing candidates' names for alcalde. When I asked the taxi driver, Hugo Loza, if corruption is rife among elected officials here, he turned to me and grinned: "They're all the same, no matter who you put in office. Corrupt. Todo". He asked me where I came from and told him I'm from Estados Unidos but originally from Filipinas. 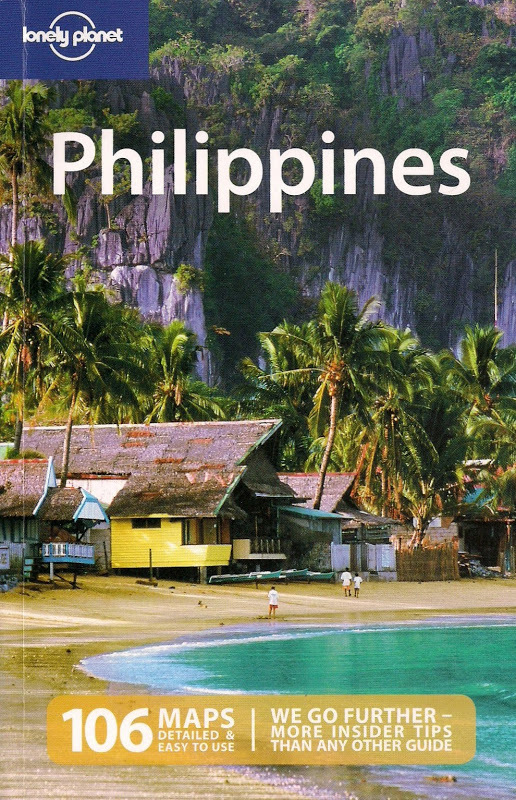 He wondered why I don't speak Spanish, thinking all along that just like his motherland, the Philippines was colonized by Spain. Well, after 300 years under Spanish rule and 50 years of American occupation, Hollywood's influence on Filipinos have been more dominant. And Spaniards never really taught their language to Filipinos anyway. 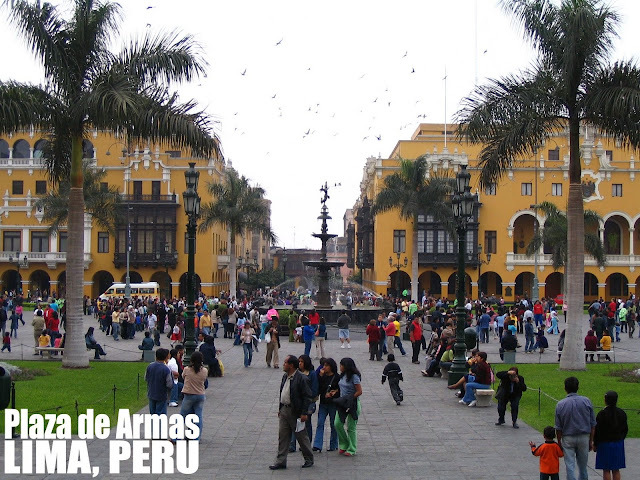 The Plaza de Armas, considered a UNESCO World Heritage Site, is situated where an Inca temple and palace used to stand. It has been the center of administrative and political power since the city was founded. What we see now are glorious Spanish architecture dominated by the Palacio de Gobierno, Palacio Municipal and the Catedral de Lima. There's a bronze fountain in the Plaza's center to which most visitors congregate. Since it is holiday today, lots of locals swarmed the four corners of the Plaza. I moved away from the Plaza's mayhem and into another jampacked pedestrian street of La Union. I took a quick lunch at one of the many restaurants, the manager there made sure I got what I wanted knowing that I was the only foreigner among the local crowd. There was a queue at the Museo de la Inquisicion y del Congreso but it was well worth the wait as besides the entrance being free, it offered me a glimpse of how the Spanish Inquisition sowed terror in the minds of alleged heretics. We went through cramped prison cells and torture chambers below street level. It reminded me of Fort Santiago in Manila, a Spanish fortress that saw suffering and death even long after the Spaniards left the Philippines. I got into a taxi again and decided to hit Larcomar, the open-air mall built into the cliff-side overlooking the Pacific ocean. It's very trendy, populated by well-heeled Peruvians. Most of the tourists who stay in the district of Miraflores end up here to sample some high-end shopping and of course, sight-seeing. There's a swirl of activity besides shopping in this area. Down below, surfers in wet suits were riding the waves pummeling the coast while above us, paragliders were riding the thermals that lift them up heavenwards. If not for the fog caused by the Humboldt current prevailing in Peru's coastline, it would have been a perfect perch here in Larcomar to watch the sunset. With nothing else to do, I just sat at one corner to watch the world go by. A young Peruvian woman wearing huge earrings and flashy make-up sits next to me and surprisingly breaks the ice by asking me in English: "Are you alone?". I smiled a "yes" and before my thoughts could go somewhere else, she started asking me where I'm from, what I'm doing in Peru and all sorts of questions I usually get from fellow travelers. I had this strange feeling what she's up to. She offers finally: "Why don't we go somewhere and have some beer, have some fun before your flight". Aha, I'm being baited but no senorita, (even if she's insistent), I'm not falling for it. At this point, I said to her my pre-arranged taxi is already waiting for me. Adios! I went back to the airport, checked-in for my flight and settled myself into Lan Chile's business class lounge where I was able to take a warm shower finally (after Hostal Don Victor's dismal plumbing gave me a jolt of cold shower). Thanks to complimentary internet, I can now do some update on this travel journal before getting into my overnight flight. You have been to a lot of places. I find it hard what to read first and this one is just of those stories that interest me. Nice travel story in Liima you had.